2013 DB9 and the Vanquish are neck and neck until 5500 RPM when the Vanquish widens the gap (IIRC a valve opens to draw more air). 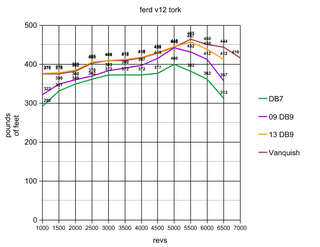 2009 DB9 falls behind, but it somehow matches the other two at 5000 RPM. What’s that speck in the rearview mirror? Oh, it’s the DB7.